I've been receiving some very nice emails with ideas for small spaces lately, which is so thoughtful and thank you everyone who has been sending! I'm determined to be a better blogger and post more often, so I'm going to start interspersing my longer blog posts with small space inspiration pictures. So even though your space may not look exactly like the photos (and whose does really?) hopefully you can find some ideas for future renovations. This room looks like it could come from a Anthropologie catalog. 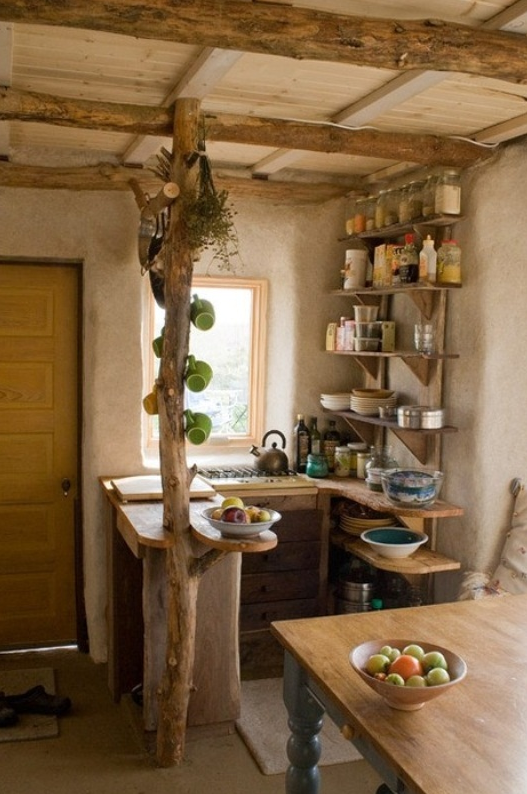 What I wouldn't give for that adorable mug/shelf branch, it adds so much character and whimsy to a tiny kitchen space! They've also made good use of vertical shelving for a visual display of containers/tools. Making scrambled eggs in this environment seems less like a chore and more like a visit to Narnia.